Mohammed Febin Poovamparambil from Thrissur, B.E. - B.Tech Graduate. Mohammed Febin Poovamparambil is Renewable Energy Engineer and currently have no work experience. are one of expert skill area's of Mohammed Febin Poovamparambil . 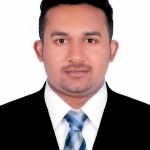 Mohammed Febin Poovamparambil is working in Power and Utilities industry.